Felix Haas Hall houses classroom, office and laboratory space today. Known by many names since opening in 1908, Felix Haas Hall has a long and storied history. Originally known as Memorial Gymnasium, the building was built as a memorial to the football players, students and alumni who died in the famous 1903 Purdue train wreck. The football team was traveling south to face Indiana University on Oct. 31 when the train collided with a coal train in Indianapolis, killing 17 people, 11 of whom were football players. W.J. Jones of the U.S. 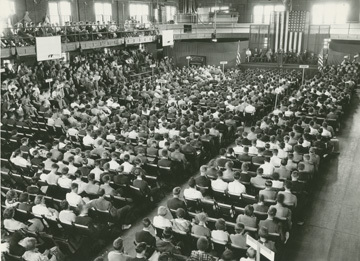 Agricultural Experimental Station at Purdue suggested that a gymnasium be built as a memorial to those who lost their lives. The building has 11 steps, a landing and six more steps representing those who perished. More information about this historic event is available here. The building, at 250 N. University St., was intended to include an auditorium, social and reading rooms, a billiards room and a gym. However, due to limited funding, only a gym with an elevated track, swimming pool, showers, lockers and a trophy center and lounge area were included in the floor plan. When it opened in 1908, it was one of the best athletic complexes in the country. Memorial Gymnasium hosted men’s basketball games until 1938, when Lambert Fieldhouse was completed. Until that time, commencement ceremonies were held in the gym, which could easily be converted into an auditorium. The building was then used as the Women’s Gymnasium until 1985, when the building was remodeled to accommodate the Department of Computer Science. Renovations included faculty and graduate student offices, laboratories for undergraduate and graduate students and research laboratories. In 2006, Lawson Computer Science Building was completed, prompting the renaming of the Computer Science Building. The building was renamed for Felix Haas, former dean of the School of Science from 1962 to 1974 and university provost from 1974 to 1986. Haas was head of the Division of Mathematical Sciences until being appointed the first dean of the School of Science. Haas was also instrumental in the development of the Department of Computer Science at Purdue. After his retirement from the position of provost, he continued at Purdue as a professor emeritus, teaching classes without pay from 1991 to 2002 to relieve female instructors with young children of heavy teaching loads. 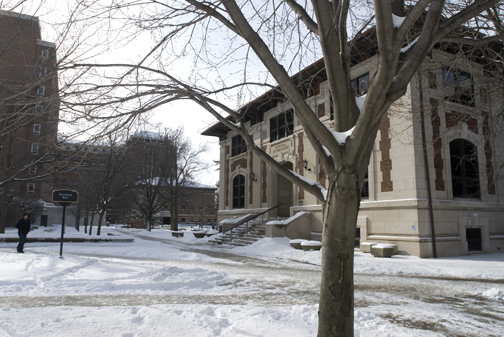 Today, Felix Haas Hall houses faculty offices, classroom space and laboratories for classes in various departments.